We stepped off the trail into a wall of shoulder-high sword fern, letting the rainforest swallow us. A vague path, barely discernible, lead deeper into the copse. Feeling our way over a rotten log, the route opened at the edge of a swamp. Soaring redwoods were all around. “This is it,” I thought to myself as Lisa clawed her way ahead. Moments later, there it was, the tree, the great tree. The trunk was a wall of wood, broader than what we think of, when we think of trees, even redwood trees. We were boggled, and we hadn’t seen the half of it. Looking up, the architectural complexity of the giant unfolded as massive arms emerged at one-hundred-and-fifty feet. One swept downward for half that distance, and then re-sprouted as an entirely new tree, a big tree, big enough to reign supreme in most forests. This sub-tree grew straight for the sky, topping out at well over two-hundred-feet, still a ways short of the main crown. I lay below the titan, tapping a tangible energy. I had seen the great tree two weeks earlier, while doing research for my latest book project—Big Tree Hikes in Redwood Country. At the time, my partner and I were suffering from big-tree fatigue following several days of hiking in the old growth, not too dissimilar a situation from the much-publicized “discovery” of the grove featured in Preston’s The Wild Trees. When I spotted the leviathan from a distance, I noted it as exceptional, and kept moving. But something drew me back, even from the damp seat of my kayak. Paddling through forests of big trees fills a quirky niche in the world of paddling, and floating in the world’s tallest is the logical extreme of that pursuit. 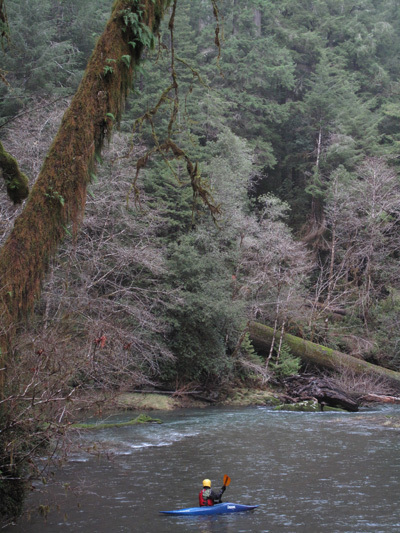 Mill Creek in Jedediah Smith Park is one of four boatable streams that flow through un-cut redwoods, and for sheer proximity to the most remarkable trees, it is arguably the best. 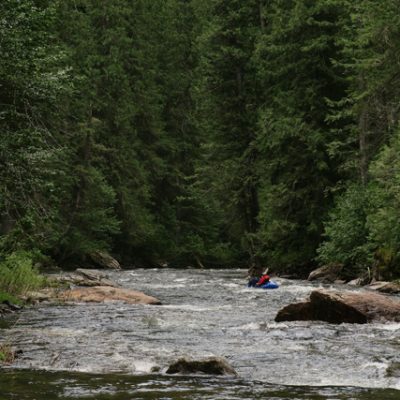 The whitewater is negligible, although class II gravel bars, occasional strainers, and shallow water limits the type of boat that could make the run. With a steep slimy put-in, and a quarter-mile carry at the take-out, the run seemed suited for our kayaks. We launched at the Howland Hill Road bridge, and paddled to the cold green waters of the Smith River before taking out. After making our side hike to the great tree, we might have been sensory overloaded, but the magic of flowing water soothed away any big tree hangover, and we glided easily through forest primeval. A thirty-inch steelhead eddied quietly behind a rock as I floated past. A hard-flying hawk landed confidently on an overhanging maple, and we drifted below. At the big river, we picked through a web of alders to reach a small beach, and hoisted our boats for a walk past the Stout Tree, a remarkable specimen in a grove of ancients. Reaching the top of a hill, plastic came crashing to pavement with relief. Before starting to jog the shuttle, I took a moment. 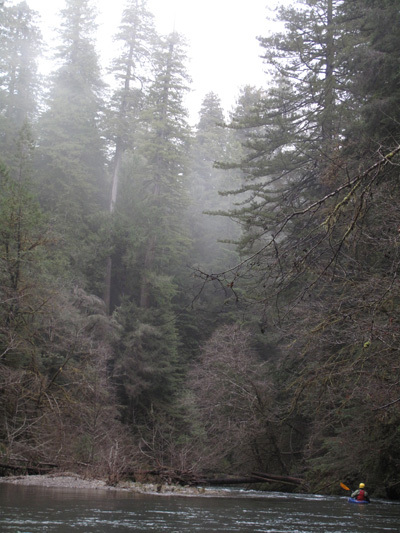 My own steam mingled with that of the cool misty forest. These woods had left their mark on me, yet one more amazing landscape that paddling has allowed me to enter.